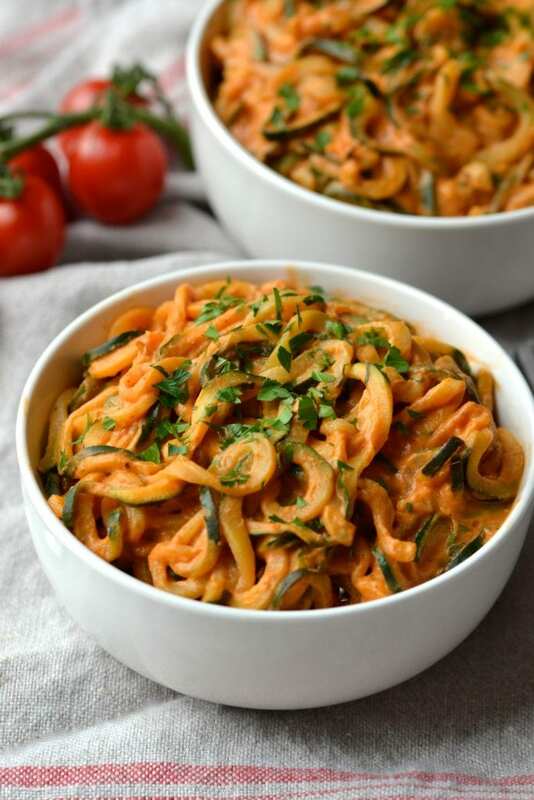 Even if I was a dairy eating machine, I would still make all of my creamy pasta sauces with cashews. I love how light yet deliciously creamy cashews make a sauce when blended into a smooth cream like texture. The base for this sauce was inspired by my 3-Ingredient Alfredo which is one of those, “this is way to simple to taste good but holy sh*t it’s amazing” kind of recipes, (that’s actually how a reader described the sauce and I thought it was too funny and accurate not to share). 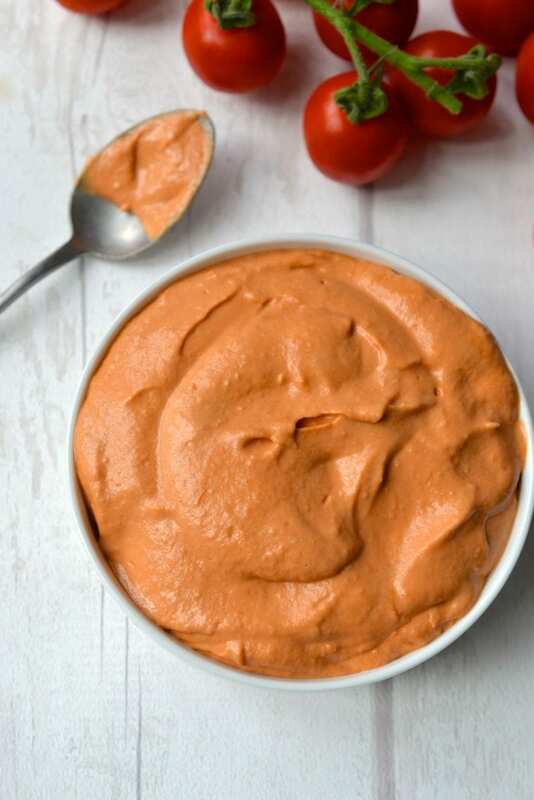 The cream base is then mixed with tomato paste and oven roasted tomatoes to create the perfect cross between alfredo and tomato sauce. I get a lot of questions about whether canned tomatoes are Specific Carbohydrate Diet Legal. As a general rule most canned tomatoes are not allowed on the diet, but Italian tomato products are an exception. Unlike American products, Italian law requires that all ingredients, no matter how trace the amount, be listed on the label. 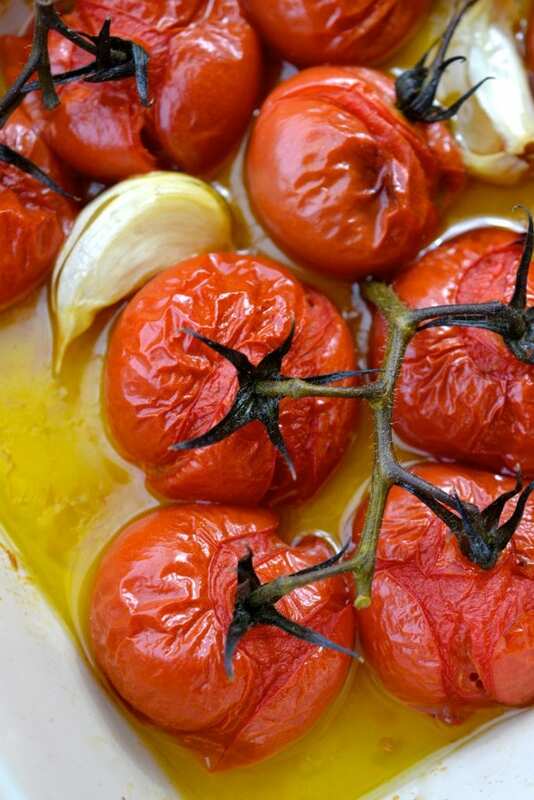 Because of this, you can be guaranteed that any Italian brands of canned tomatoes that list just tomatoes, salt and oil under the ingredients contain just that, and nothing else. 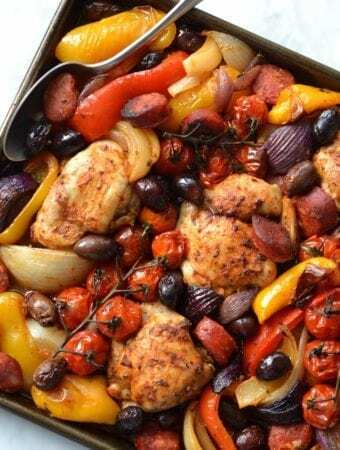 I prefer the flavour of roasted tomatoes which have been baked in the oven for 30 minutes, but if you are short on time, you could add a can of chopped tomatoes instead, I promise not to judge. 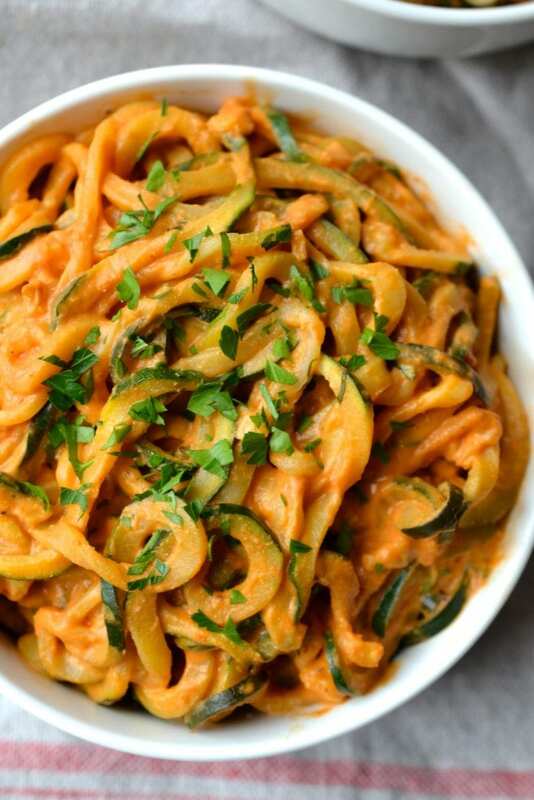 Ok so lets talk zucchini noodles for a sec. 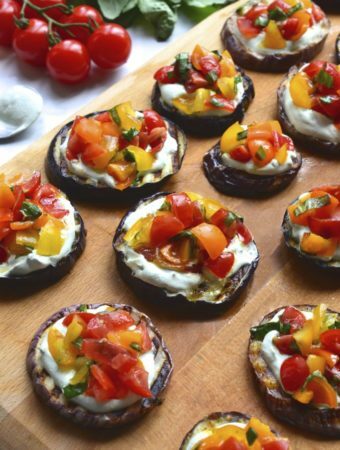 When cut too thinly or overcooked, they are pretty gross and absolutely nothing like pasta. 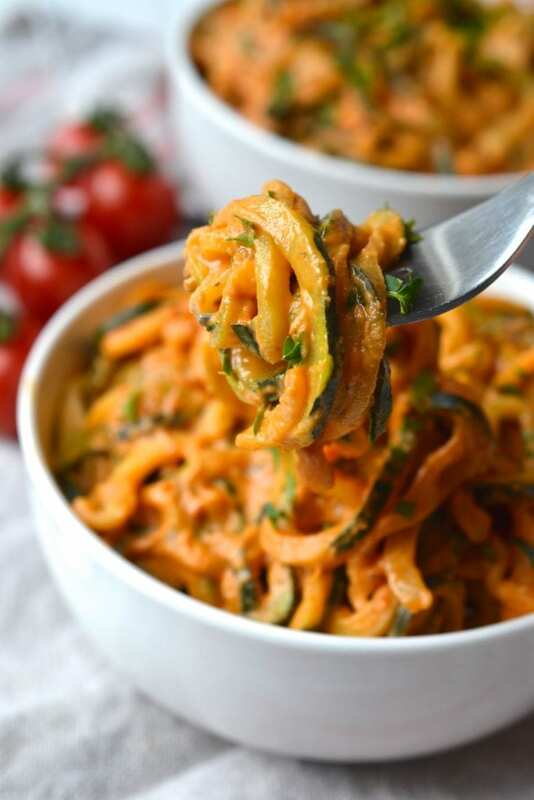 I’ve found that the key to getting them right is using the thicker setting on the spiralizer so that they are more like linguine then spaghetti. Secondly, don’t precook the noodles. 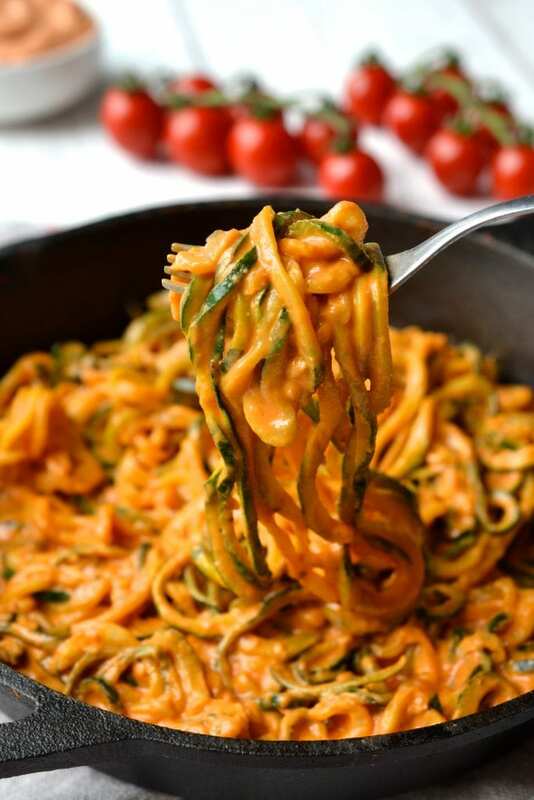 Because the sauce for this recipe is so thick, by heating the sauce in a covered pan along with the zucchini noodles, all of the excess liquid from the zucchini helps to thin out the sauce. By preparing the dish this way, the noodles don’t turn to mush and you won’t end up with a super liquidy sauce. 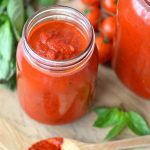 This recipe makes a lot of sauce, more then you will need for one meal, but it freezes really well so you can freeze it in small portions for future meals. 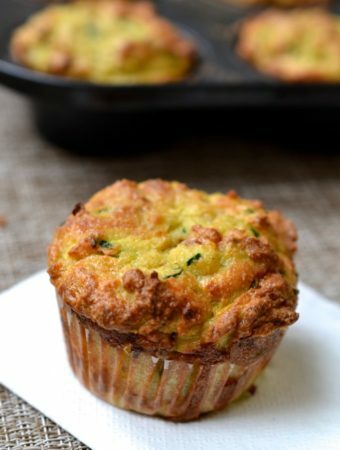 Feel free to play around with the recipe. 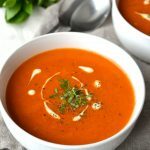 You can add in more tomato paste if you prefer a stronger tomato flavour, raw garlic for a strong kick, chili flakes or more cashews. 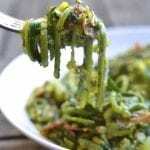 You could also add in some shredded chicken, spinach or prawns to the pasta. 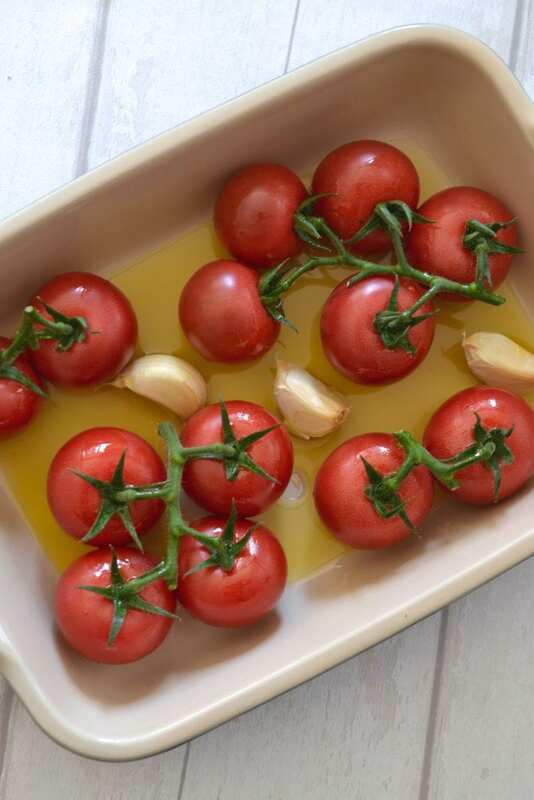 Place the tomatoes and garlic cloves in a baking dish, drizzle in the olive oil and bake in the oven for 30 minutes until blistered and tender. 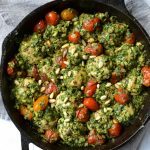 Once the tomatoes are done baking, in a high speed blender or food processor combine the cashews, tomato paste, roasted tomatoes, garlic cloves, chili flakes and salt. Blend for a few minutes until the sauce is completely smooth and there are no bits of cashew left. 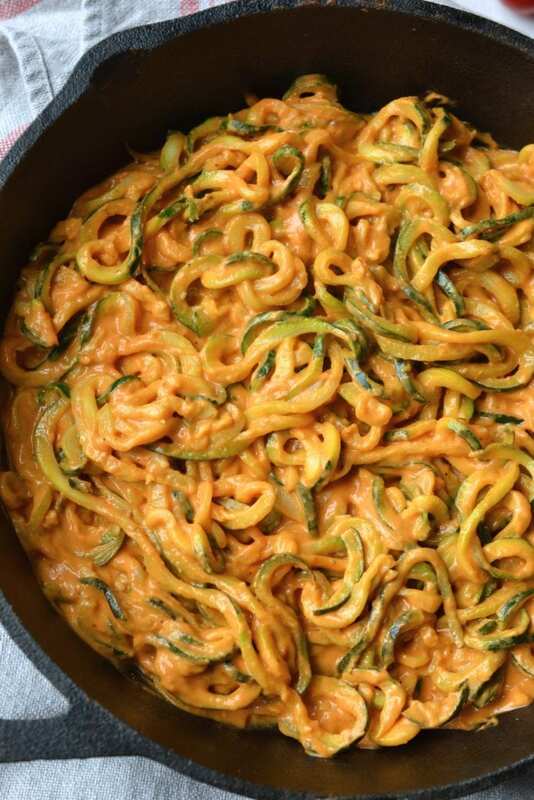 In a large skillet on medium heat add the zucchini noodles, half of the sauce and sprinkle with salt. Cover the pan and let everything cook for 8-10 minutes depending on the thickness of the noodles. 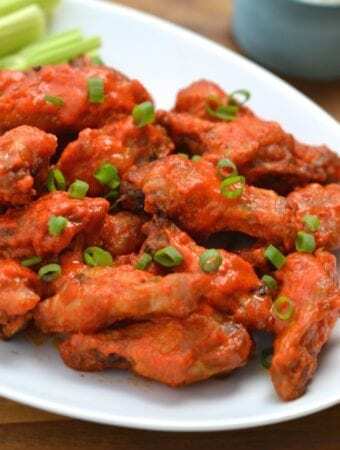 Add more sauce if required. 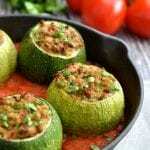 The zucchini should be cooked through but still crisp, make sure you don't overcook them otherwise it will turn to mush. 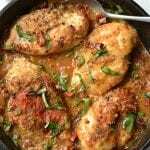 If you are adding in chicken, spinach etc add it in with about 2 minutes left of cooking time just so that it warms through. Serve the pasta topped with fresh parsley, basil or chili flakes. Enjoy! My sauce never turned creamy and silky like yours! I used my ninja blender to mix, but there are still cashew bits throughout. Any suggestions? I probably blended it for 5 minutes before giving up. 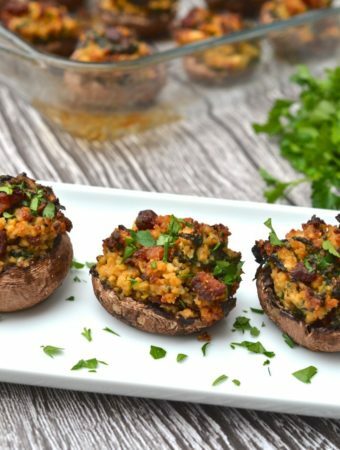 I am doing the whole30 and I am so excited to try this! Thank you for sharing! Mine turned out so watery! 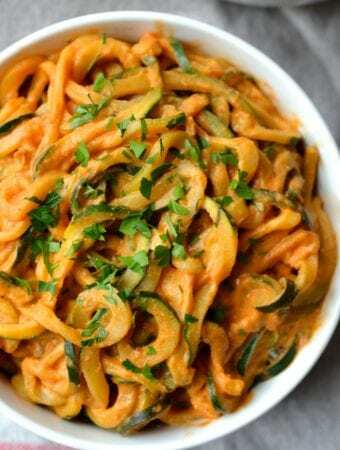 The sauce didn’t stick to the zucchini noodles at all. Why did this happen? oh no! I’m so sorry to hear that! I would recommend adding more cashews to thicken the sauce if it becomes to watery. Also the zucchini noodles release a lot of liquid so letting them drain in a sieve for a few minutes before adding to the sauce will also help. Yea!! So happy to hear you enjoyed it! Oohhh I bet it was delicious with pasta and meatballs, that sounds so good!